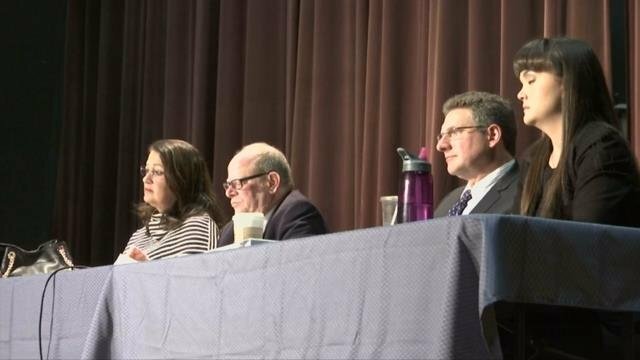 GREENFIELD, MA (WGGB/WSHM) –Hundreds of Franklin County residents turned out Wednesday night hoping to convince state officials not to allow the company behind a proposed natural gas pipeline to use eminent domain to survey their private poverty. It’s just one in a series of meetings the Department of Public Utilities is holding across the state. Kinder Morgan, the company behind the Tennessee pipeline was hoping to be granted rights to survey private property by the beginning of March, that would allow them onto people’s yards to survey for their pipeline. Many at Wednesday night’s meeting say they won’t allow it. For Jim Cutler of Ashfield, it’s personal. His mother’s ashes are buried around a tree in his backyard that would be directly impacted by the pipeline. “That’s where I put her ashes, and that happens to be ground zero for where they want to put that pipe,” Cutler said. He’s not alone. Nearly 80 people out of a massive crowd signed up to try and convince the DPU not to allow the surveying. It all comes as Kinder Morgan is suing the state of Massachusetts, which blocked an easement they had gained from the Federal Energy and Regulatory Commission to cut down trees in Otis State Forest in the Berkshires. It’s something Attorney General Maura Healey says breaks state conservation laws. Many people at the meeting said this is about following the constitution, and state conservation laws which protect Native American lands and burial grounds as well. “This is about private property rights and giving a private corporation the authority to abuse those rights for profit essentially,” said Sam Stegman of Conway. A Berkshire County group called Sandisfield Taxpayers Opposing the Pipeline, or STOP, of which Cutler is a member, is also planning to sue Kinder Morgan. Cutler says he’s ready to band together with others in civil disobedience should his yard be affected. Western Mass News reached out to Kinder Morgan’s press office this evening and left a message for comment. They have not returned our call. Meantime, the DPU is not expected to make a decision until early May.